New York, NY, September 11, 2017 –(PR.com)– In honor of the 2018 Winter Olympics in South Korea, Cultural Corps of Korean Buddhism is kicking off festivities with a Cultural Week of Korean Temple Food and a real taste of what it’s like to visit Korean temples. The public will get to experience this without hopping on a plane and instead just hopping over to Astor Center in New York City from September 26 to 28. Korean Temple Cultural Week is open to the public for the very first time, featuring events such as exhibitions, mini workshops, lectures, cooking demonstrations, tastings and dinners. With history dating back 1,700 years, participants will open doors to the meditational tradition of Korean Buddhism through the Korean Templestay program. 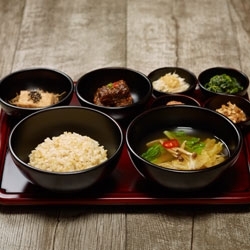 And through the practice of Korean temple food, participants will learn how to eat necessary amounts of food and how to be mindful of the body and mind, which goes beyond the act of eating. Cityscapes aside, these sacred practices will be taught in the midst of beautiful nature as they naturally are. For an authentic experience the event will be overseen by Beop Song, Buddhist Nun Chef, who is traveling here from Yeongseonsa Temple of Daejeon City, South Korea. She has refined her practice of temple cooking with the guidance of master monks and nuns who have a deep foundational knowledge of the cuisine. Over the years, she has been actively sharing her expertise in Korean temple cooking both in practice and in paper so that people, whether Buddhist or not, can easily approach temple food and participate in its mindful cooking and eating. The public will have four opportunities to embrace Korean Cultural Week’s offerings across its three days. • From Tuesday, September 26th-Thursday, September 28th, from 12 PM-3 PM in “The Gallery,” up to 100 people per day have the chance to immerse into Korean temple exhibitions and cultural experience encompassing templestay, tea ceremony, lotus lantern making, tasting Korean temple food and more. • On Thursday, September 28th, from 11:30 AM-2 PM in “The Study,” up to 36 people can see a traditional Korean cooking demonstration, then follow it with a timeless luncheon.